Marine biologists have identified two new species of sea-dwelling, mushroom-shaped creatures that don't belong to any known taxonomic classification. Say hello to a completely new genus: Dendrogramma. Back in 1986, the authors of the new study pulled two distinct organisms from depths of 400 and 1,000 meters along the south-east Australian continental slope. The mushroom-like organisms were multicellular and mostly non-symmetrical, with a dense layer of gelatinous material between the outer skin and inner stomach cell layers. The two distinct species couldn't be slotted into an existing phylum, so the researchers had to create a new one. Just to give you an idea of how rare it is to find a new lineage, it's only happened two or three times in the past 15 to 20 years. Called Dendrogramma, it's a reference to dendrograms, the tree diagrams used in biology to illustrate evolutionary relationships between organisms. The two species themselves have been named enigmatica and discoides, which hint at their strange character and shape. Interestingly, the scientists found similarities between these organisms and members of Ctenophora and Cnidaria, which suggest a possible relation. They also found similarities to 600 million year-old Pre-Cambrian life forms that are now extinct — potentially early but failed attempts at multi-cellular life. 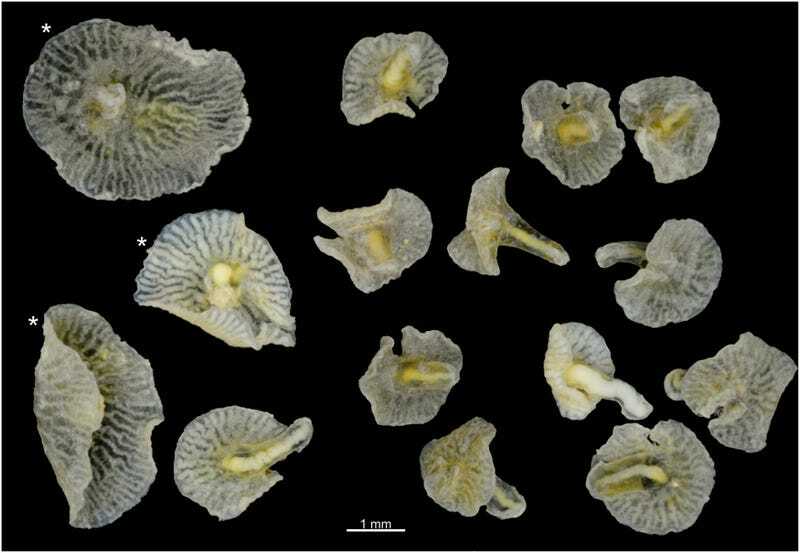 Read the entire study at PLOS: "Dendrogramma, New Genus, with Two New Non-Bilaterian Species from the Marine Bathyal of Southeastern Australia (Animalia, Metazoa incertae sedis) – with Similarities to Some Medusoids from the Precambrian Ediacara". Top image: Jean Just et al/Plos|One/Jorgen Olesen.